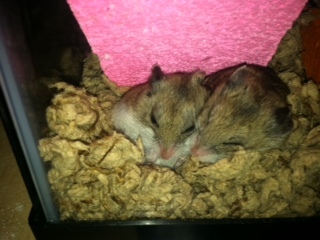 Our dwarf hamsters, Gloria and Rhoda, sleeping under their pink rock wall. I didn’t sleep very well last night — my mind has been reeling lately about planning book events, making it hard to wind down. I got up as usual at 7:30, but napped a bit this afternoon post-lunch. I’m feeling refreshed, but I always wonder whether it’s a good or bad idea to nap in the middle of the work day. Being able to do so is one of freelancing’s major benefits, which perhaps is why it feels so decadent. Years of office training make it seem impossible, and thus lazy. But sometimes you need to do what the body wants. I’ve been reading this great old, out-of-print “diet” book called Eating Awareness Training, and it is remarkable for the fact that all it does is teach you to eat when you’re hungry and stop when you’re full. It has an elaborate system to do this, with point values for hunger and a mandate that you write down everything you eat. This is necessary because humanity has done such a good job distancing itself from its natural wisdom. If we all ate only when hungry and stopped when full (not stuffed), most of us would not have weight problems. And yet this book was necessary, and furthermore it went out of print, because it was so revolutionary. If everyone did this, the diet industry would die. How does this relate to naps? I suspect they’re the same. We’ve taught ourselves a million shoulds and shouldn’ts, when our bodies know everything they need. And freelancers are lucky enough to be on their own schedules, so we can take more advantage of our natural rhythms (that is, if we don’t have kids). It’s our little reward for never quite knowing if we’ll have enough money this month. * Your brain likes a nap sometimes. * It lowers blood pressure.